PDF instructions are included to walk you through every step of this In the Hoop Project! Great for birthdays and baby showers! PDF instructions are included to walk you through every step of this In the Hoop Project! Great for birthdays and baby showers! Birthday Hat, In The Hoop - 3 Sizes! Sugar and Spice Curly Whimsical Font - 5 Sizes! 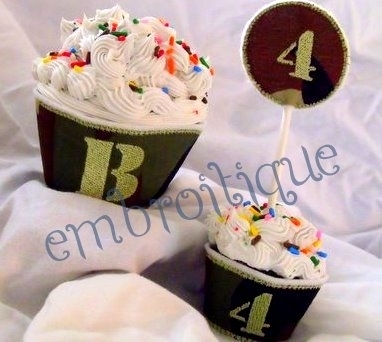 Polkadot Alphabet Cupcake Wrappers and Toppers - 3 Sizes! 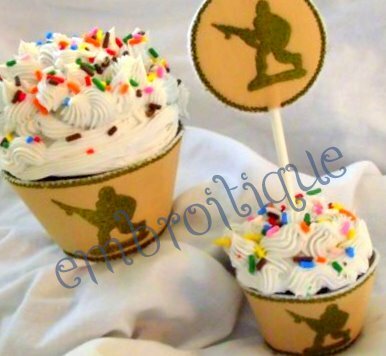 Finish Size: Toppers 3.7" x 3.7"
Finish Size: Wrapper for Mini Cupcakes 2.4" x 6.4"
Finish Size: Wrapper for Snacks or Regular Cupcakes 3.4" x 9.0"